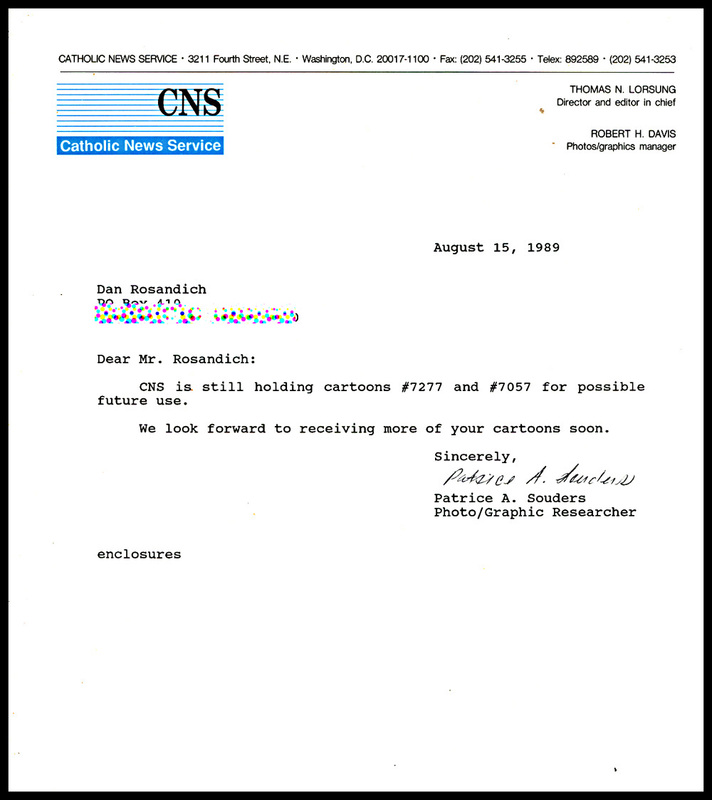 Catholic cartoons were sought by many editors and there were even news services that catered to catholicism. They would supply written content such as news articles, topical stories, photographs and illustrations. And first and foremost to cartoonists, they also sought quality gag cartoons that pertained to religion. Many of my religion cartoons are relatively “generic” in nature and cover a broad spectrum of belief. Many focus on church humor, the life of a pastor or the clergy. At the same time, as I advertised and was promoting cartooning services to the publishing market, I received inquiries from Christian children’s publishing companies to illustrate various articles and stories. 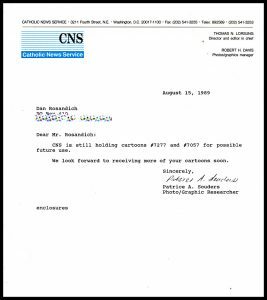 I used to get my catholic cartoons distributed through Catholic News Service and the letter I’m showing here, is from their ‘photo / Graphic Researcher’ Patrice A. Souders who at the time used my material in their distribution offerings that went out to editors of church newsletters and magazines around the country. Cartoon ideas about the topic of religion are sometimes difficult to generate. However if you are in the church as an active member, you probably have some excellent ideas and concepts that would be considered “inside jokes” about your specific beliefs. Feel free to contact me at anytime with questions are if you have ideas for a new cartoon you need. No question is too big or small when it comes to cartoons.